Whether your answer is yes or no, this article is worth the read because you or someone you know may find it useful. People of all ages can fall prey to bullying. 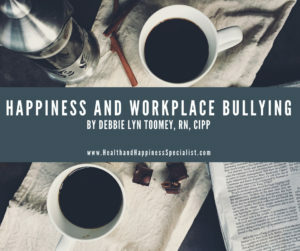 While we typically hear of incidents of bullying on school grounds, little is mentioned about bullying that occurs in the workplace. Since August is “Don’t be a Bully Month,” it’s the perfect time to bring more awareness around this insidious and silent issue. Workplace bullying is toxic. It creates an unhappy and unhealthy environment. Workplace bullying effects not only the victim, but also the witnesses, and eventually the organization. The closest incident that I have experienced of being bullied (lateral violence) was when a nursing colleague complained about me and challenged my nursing practice in front of other nurses. It came unexpectedly and it shook me to the core. I couldn’t focus on my work after that because I was consumed with feelings of anger, betrayal, disappointment, and so much more! Needless to say, I was not happy due to the unprofessional treatment that had just occurred. I’ve never been treated like that before! I always strived to be kind, thoughtful, and helpful to everyone. I always went out of my way to support that nurse because she always complained about something unfortunate in her personal life. Workplace bullying is any act of incivility, disrespect, and mistreatment to another at work. In its most severe form it can become violent. Damages from such unprofessional and inappropriate actions can cause psychological injury, physical injury, or death. According to the CDC, professionals who are at most risk for fatal violence in the workplace are people in sales, protective services, and transportation. On the other hand, professionals in the health care and social services are at risk for nonfatal violence that results in sick days or leave of absences. Workplace bullying is real and should not be normalized or dismissed by any employers. Here are some ways to help you rise above this negativity and reclaim your happiness at work. • Breathe and regain your composure. If the bullying behavior is out of character for this person, you can give them the benefit of the doubt. Maybe, he or she is going through a negative personal event. • Talk to a close friend to get validation about the situation. Be sure to have allies where you work. • Approach and talk to the person that caused you to be upset. Relay back to him or her what they did and share how it made you feel. Tell him or her that you will not tolerate that kind of behavior. • If the person, repeats this behavior, be bold. Stand up for yourself. Know that your efforts will contribute to creating safe, supportive, and happy work environment. • Talk with your manager or Employee Assistance Program department for assistance. As for me, what worked after being humiliated by a nursing colleague was to confront her face to face. After talking with my husband about how shocked and upset I was, I mustered up the courage and the words to explain to her what she did and how she made me feel. Further, I told her to never to treat me like that again. And it worked! After that moment, that nurse left me alone and became more courteous. I was so proud and happy with myself for speaking up! It is important to avoid toxic and harmful behavior from escalating by speaking out and standing up for yourself. You should never feel that you have to be subjected to any sort to bullying from anyone. You have the right to be happy and feel supported at work so that you can perform your duties. I hope you never have to experience workplace bullying, but if you do, never feel you have to put up with that kind of behavior. You have a choice to either take it or leave it. If you do decide to take it, be sure to give it back and stand your ground. If you need coaching to gain more happiness in your life, contact me at info@healthandhappinessspecialist.com. This entry was posted in happiness, mindfulness, Positivity, self-care and tagged happiness, life-work, relationships, solution. Bookmark the permalink.